To help you get yourself together, designer Erin Vale has created some stylish lists you can print and fill out. 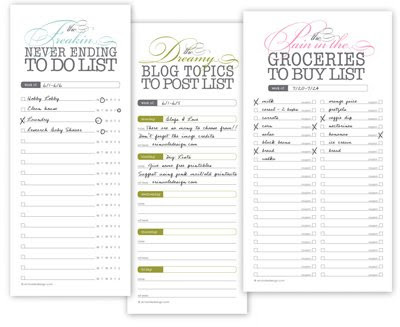 Download the to do list, blog topics list, or grocery list. And then if you're really ambitious, you could get some padding compound and make notepads out of the sheets you print. Write that on the Freakin Never Ending To Do List. You have read this article downloads / paper / printable with the title Printable lists. You can bookmark this page URL http://jenkrebs.blogspot.com/2009/07/printable-lists.html. Thanks! No comment for "Printable lists"